He began his conducting career in 1988 as an assistant of Daniel Barenboim in Paris and Bayreuth. He became Pierre Boulez’s assistant at the Ensemble Intercontemporain in Paris in 1991. He became successively Music Director of the Opera in Rouen (1991-94), the Jerusalem Symphony Orchestra (1998-2001), the Mannheim Nationaltheater (2004-2007), the Santa Fe Opera (2009-2013) and for his second tenure, the Jerusalem Symphony (since 2011) Frederic Chaslin divides his activities equaly between operatic and symphonic performances. At the opera, he conducted the major companies in the world, New York Metropolitan (since 2002), Los Angeles Opera, Berlin Deutsche Oper, Munich Bayerische Staatsoper, as well as Leipzig, Dresden, Madrid, Bologna, Roma, Venice, Torino, Tokyo, Oslo, Copenhagen. Frederic Chaslin made his debuts in 1993 at the Bregenzer Festspiele for Nabucco (93, 94) and Fidelio (95, 96). This started his Austrian career and since then, he is a regular guest at the Vienna State Opera where he conducted nearly 200 performances of 34 different tittles. Major recent appearences were two new productions of Tales of Hoffman in Dresden and Copenhagen. 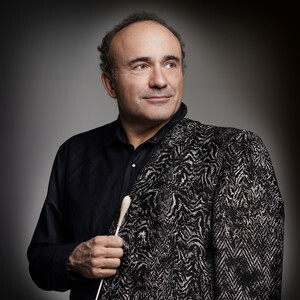 In the symphonic repertoire, he’s conducted all major french orchestras (Orchestre de Paris, Orchestra National, Radio-France Philharmonic, Paris Opera Orchestra), the Milan Scala Philharmonic, Torino Rai, Manchester Hallé, London Philhramonia, London Symphony, Vienna Symphony, Vienna Philharmonic, Spain National Orchestra, Gulbenkian Foundation Orchestra (Lisbon), Israel Philharmonic, Nagoya Philharmonic.